Kit Yamoyo wall painting, George Compound, Aug-16. Image credit: Lawrence Wilbraham. Last Thursday (1-Sep-16) Pharmanova launched a new, lower priced, Kit Yamoyo format (without soap) and also reduced their ex-factory prices for all Kit Yamoyo formats, across the board. This is their response to market forces in general and the issue of VAT in particular – on which, more below. 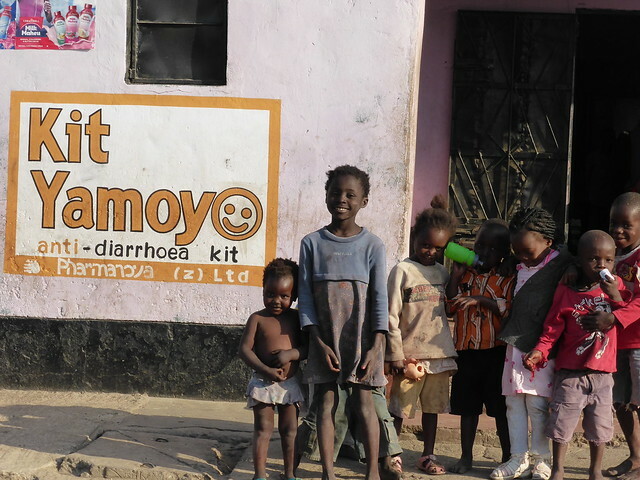 They also engaged a new sales and marketing person to focus exclusively on Kit Yamoyo over the next 3 months. 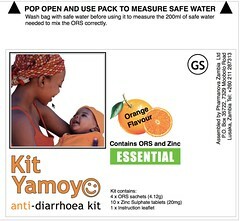 We are delighted to see Pharmanova (the Kit Yamoyo manufacturer) really committing to make Kit Yamoyo a commercial success. Regular readers will remember that in May-16 the Zambia Revenue Authority (ZRA) ruled that VAT should be charged on Kit Yamoyo because it contains a small soap bar. I wrote about this here. Pharmanova challenged this ruling, but the outcome, at the time (May-16), was an unworkable compromise. The ZRA agreed that we only needed to charge VAT on the soap component of the kit. While this would only add 3% VAT to the kit overall, the problem is that the accounting system at Pharmanova can’t deal with a VAT rate of 3%: it’s 16%, 0% or exempt. The same goes for the accounting system at Zambia’s main supermarket chain, Shoprite. So, we were stuck with having to charge 16% VAT on the whole kit – and the knock-on consumer price increase this entails. This remains the case for kits going to Shoprite – there was no way round it. However, other wholesalers and distributors are able to deal with two invoices for each batch of kits they buy: one for the soap component with 16% VAT added and one for the other components of the kit with 0% VAT. Prior to these changes, the only product available was Kit Yamoyo ORIGINAL (with soap) with an ex-factory price of K9.28 (inc 16% VAT). Now the cheapest product is Kit Yamoyo ESSENTIAL (without soap) at K6.50. Thus, the removal of the soap and the VAT it attracts represents a 30% reduction in ex-factory price. Hopefully these price reductions will ripple through the value chain and will be reflected in reduced wholesale prices to retailers and the retail prices to caregivers. We will be monitoring this through our weekly dashboard analysis of key performance indicators which are published here. 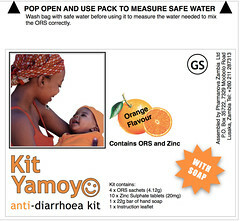 We are very sorry to lose the soap in the new Kit Yamoyo ESSENTIAL format; we believe it helped carry a strong ‘Wash Your Hands’ message. However, we believe that this new format will increase affordability and therefore access to the essential ORS and Zinc for diarrhoea treatment. It is interesting to reflect on comments from bi-lateral donors, made during the funding negotiations. “How will you control the price? How will you ensure the manufacturer won’t just put prices up?” they asked. Our response was that the manufacturer is interested in maximising profit and market share, not in maximising the ex-factory price. Competitive pricing will increase sales and thereby improve the manufacturer’s total profit because the reduction in gross profit per kit sold will be more than compensated for by increased sales volumes. These price reductions are very welcome in their own right but just as important is that this action by Pharmanova is a demonstration to all that Pharmanova has taken ownership of the Kit Yamoyo brand and its future. This is an essential component of our sustainability strategy.